One of my favorite images of Ian -- and on the cover of the Rolling Stone to boot! I have a copy of RS No. 87 July 22, 1971 (purchased in an old bookstore in Ann Arbor, MI many years ago), which I am quite sure is the only time Jethro Tull or Ian has ever been on the cover of that rag. I've got a copy of the above edition of Rolling Stone in the archive somewhere. Can't exactly remember where I got it from after all these years but it was one of the Tull items that got me into the collecting bug. There was a second hand magazine and record shop in Streatham in south London that I used to go to now and again so it may have been from there. The shop closed down years ago which is a great shame as it was one of a kind, run by a very knowlegable guy who knew where everything was even though the items on the shelves looked as though they were in no particular order. That and the legendary Beanos record shop in Croydon were two of my "must visit" places on my shopping list ! A quick heads-up for Forum readers that the June edition of Record Collector (Bob Dylan on the front cover) has a fascinating in-depth interview with Martin Barre, plus some brilliant photos, in an article by one of the world's leading rock journalists. Ahem. has anyone managed to get a hold of this book yet and if so is it more than just a rehash?! please advise!!! Boy o boy, I sure hope this guy is asking a reasonable price. Now had this been presented to me prior to the net, and really moreso prior to A New Day in 1985 or 6 I would rabidly have pursued it. Additionally I get where it concerns a record that many in Tull land hold alot more dearly than myself. However the initial heads up to me is the guy is writing a book about A Passion Play and out of the hundreds or thousands of pics now available of Tull from 73 he uses one on the cover from the following tour. "Light grows all that I conceive, ashes everything I leave: Flame I am assuredly." Always gave the guy huge points for originality of conception. Cannot remember the name of the guy who wrote it, but I am not dead certain it is not the same guy mentioned here, at least I think it was Brian something, a young lawyer from KC if I remember correctly. Well now in backstepping I see Passion Play is merely the title. Probably should delete everything I wrote as it is actually a review of the band from an insider, which may indeed be the same guy, who appears to have had an access to the band similar to that guy with the beautiful but expensive coffee table book from Germany. Yes. By all means pursue it. Lol. The publishing date seems to have been put back to late summer time. I keep getting apologising emails from amazon about its non arrival. So we wait and see. It's horses for courses in many respects - so much has been written about the band over the years that I half expect there to be a lot of pictures we've already seen and stories already told but I live in hope that there will be some new stuff in it. Come on Ian, how about an autobiography. In my mind it is about the right time to put the record straight. Brian Meyers is the author you're thinking of Ray. The first one I remember was an Australian (bloke) who, at the time of "A Passion Play," wrote some obscure but well-meaning treatise on me as the poet – a thoroughly wasted literary journey since I have a distinct dislike of poetry in general and have never modelled myself on its weird and fanciful practitioners. I believe it was entitled "To Be The Play." Not many copies have survived, methinks, to grace the book cabinets and libraries of the disciples of Rock. He was a nice man, ‘though and travelled with the band in the great down-under for a few days in 1972, I think I remember. To Be the Play , Brian Meyers, p. 140, Fishergate 1978, the United States. Probably the first book about Jethro Tull, printed a few hundred copies. The cover, red, shows the faces of the masks that evoke Passion Play. It 'a kind of novel where the protagonist retreats to meditate on the music of Jethro Tull, analyzed in a very personal way (one of the keys to understanding is, for example, that in the writings of Anderson the word "you" refers to the muse of art, in other words to music). To be included this volume requires a very high level of knowledge of English and possibly even a little 'knowledge of literary and structural analysis of the text. It is not surprising that some (a name? David Rees) they have judged absolutely unreadable. Personally I liked it a lot, but gives no information about the group. Finally got to read Old Webby's article on Martin Barre in the latest edition of Record Collector. A rather fine overview of his life in music both before, during and after (?) Jethro Tull. It's obvious that he's happy with his new band and the opportunities it gives him and judging by the brief snippets of his latest music on his web site we can expect a rather fine album when it's released. 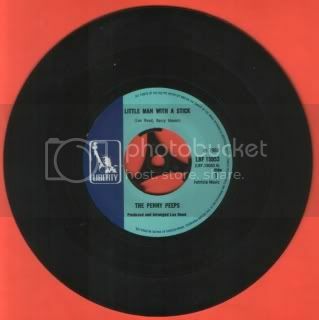 I would query a couple of the values in the discography but then ebay does throw up some extortionate values sometimes but I would value his promo cd single "Suspicion" a bit higher at £25 and the second Penny Peeps single "I See The Morning" at £50 but then that's what I've seen them going for over the last few months. 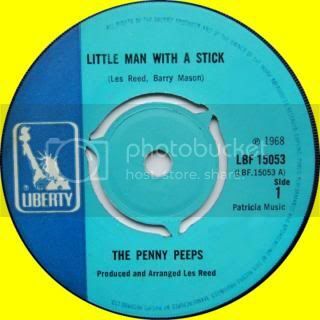 One word of warning to anyone contemplating buying the Penny Peeps single "Little Man With A Stick" - original copies on the Liberty label will have the 3 prong push out centre and "repro" copies will have the large centre hole. Don't be caught out buying the "repro" from dealers claiming it to be an original. If it had not been 1978 or 9 I would not have given it a second glance either. Of course A Passion Play had a similar effect on me at initial exposure and a less than overwhelming experience in concert, at least as compared with the prior years show, though our seats in a hockey arena were not ideal, it was thundering and somewhat ponderous. 40 fricking years ago. And Passion Play was a brand new record that I was at best only coming to terms with. Never have fully. Yes in those years there may have been 30 or so days when I might tell you it was the best thing they have done. Could even be today, as recently as last year I saw that happen. Ditto Minstrel. Too many hard words man, lol. That's why I describe Feb 75 as my best gig ever,, not APP in July 73...I mean, the album was released after the concert and it was a lot to digest without homework. I'd love to get a re-do on that now...APP around the house for a few weeks BEFORE the live show. Bernie rings another bell perfectly true. Curtailed my previous commentary before allowing for that reality, a re do on the Passion Play, but still in that year with all of them as young men. I think I have mentioned my two mescalinized buddies in the front row, your average Tull fans of that era, re would know jack of most they have done since. Even after being relatively successful parents, their jaws are still hanging open from that night. Part of why those sports arena's SUCKED, especially for Tull, where precision in sound is so very necessary. But I will bet I can take it one step further for both of us, and obviously including the Brick show for Bernie. And that step being the chance to see them in those early years of 68 thru 71 which of course Graham DID. As well as Fabs, Jimi, probably young Rolling Stones. Why do we even like Graham, lol. Freaking great point Bernie and entirely possible. Graham made it but we may not have. Sure hope Mick is alright, last I knew Glen and Clive certainly are. Brian Rabey "Passion Play, A"
We thought you'd like to know that we've dispatched the remainder of your items and that this completes your order. If you need to return an item or manage other orders, please visit Your Orders on Amazon.co.uk. And if the arrival of "Away With Words" wasn't enough, thundering through the letterbox arrived the long promised book "A Passion Play - The Story of Ian Anderson And Jethro Tull" by Brian Rabey. Full of interviews by the leading characters in the story of the band with a small, but perfectly formed group of photos from the archive of Glenn Cornick, Rich Galbraith et al and so it seems my reading material is covered for the next few days. It's going to be interesting to see what may be added to the "Tull story" and the last third of the book "The thoughts of Ian Anderson" I'm hoping will reveal a few more interesting insights into the mind and thoughts of "the headmaster". "A Passion Play - The Story of Ian Anderson And Jethro Tull" by Brian Rabey. If I was a brand new convert to the music of Jethro Tull I reckon Brian Rabey's book would be a good place to start learning about the background of the band from its beginnings in the middle sixties with the formation of "The Blades" up to, more or less, the present day. That is in no way a reason to detract from the books that have been written previously as we have here a book that is almost up to date. Many of the recollections and the stories of band members have been written about over the preceeding years but Brian Rabey has been able to solicit some stories that haven't surfaced in any of the other books and articles and for that we, as fans, must have his thanks. To give you an idea of the scope of the book, I've incuded the contents at the end of this personal review to illustrate the detail that the author has achieved. The interviews are the part and parcel of the book. He has let the various band members tell the story, warts and all, and by doing so has let the reader make up his or her own mind about the events and, more importantly, the music over the years. Some of the more technical parts of the story can, depending on the reader's knowledge of such things, seem a bit like a university thesis but they don't detract from the fact that this is a book written by an author who loves the music and has managed to interview many of the band members, both past and present, to produce a coherant and detailed "time line" of events. The most informative part of the book for me is the final third - "The Thoughts Of Ian Anderson" - ranging from tensions in the band, the recording process, song writing and the business side of the music business. The part about Ian Anderson and his dealings with promoters and venues is a eye opener, along with his statement that he was approached by one promoter to go on tour in the US with Genesis - he turned it down as it would not be viable proposition to play in exactly the same venues that Tull had only just played in. I'll be the first to admit that the book may not be to everybody's taste and I would describe it as "extremely detailed" as it is so full of information that it is not something you can read in one go. I found it better to read one or two chapters at a time and then go back and re-read that portion of the book again - yes it's that detailed in some parts that you almost feel overloaded with information. The only part that I feel lets it down is that there are so few images of the band (there are eight pages of photographs) and most have been published before. It is a pity that Brain Rabey has not been able to include images that the varous band members must have, including Ian Anderson himself, that have not been published before and would have been more than worthwhile seeing in the context of the history of the band - maybe copyright issues were the problem. All in all, a worthy addition to many fan's bookshelf and for that I would give it a hearty eight and a half out of ten for the detail and also the tenacity of the author to collect so many wide ranging interviews and background information. 16. Jeffrey Takes A Bow - M.U. 29. The End Of Tull? I've not quite finished the Rabey book yet, but I'd have to say that I find it a huge disappointment, especially after the incredible wait. Sure, it's always interesting to read interviews and there are one or two interesting snippets, but the book is not so much a book as a collection of interviews. This means that it is wildly unbalanced, with long passages on some songs with others (Heavy Horses being a case in point) not even mentioned. There is not the same clear outline of the history that David Rees supplies or the interesting analysis of songs that Nollen provides. What is really annoying is that you would not know that these two books existed. There's no attempt to use the excellent resources that A New Day has given us, let alone any reference to books on progressive rock or Moore's analysis of Aqualung. I'm sorry, Maddog, but it's nothing like a university thesis - it's a 3 out of 10 to me. I accept that the other books might not be available, but I'd hope David Rees could update his book and that, with the excellent New Day Tapes, would be the best place to start. Me, I'm looking forward to that book on TAAB/Passion Play! The TAAB/Passion Play book will not disappoint....it's the new bible at my place. I would agree that an updated version of Dave Rees' book would be the icing in the cake but as to whether that will happen is not known. Me - I'm all for the musicians speaking themselves more than an author attempting to tell the story especially now as there is so much being said about the IA and MB "split" and if they [the musicians] open up and spill the beans on what has happened in the past when there was the "big split", for example, then it's from their own mouths and not the opinions of an author. Oh and I agree about your reference to Heavy Horses - a strange omission. The typos in the text were a bit baffling but then no author or publishing company is perfect, is it? Maybe someone should take a leaf (?) from Morrissey's new book by Morrissey in that it's a huge read, has no chapters and the the first paragraph lasts for four pages! !..according to BBC News that is not because I've read it. I have read all the English language books about Jethro Tull and in my 43 years as a fan many interviews,articles etc. about the best band since The Beatles.This is one of the best. As always when I have read about people who are still alive I wonder what has been edited out. Thoroughly recommended for all Jethro Tull and Ian Anderson fans. From what I've read here and elsewhere, Tull fans either love it or don't - there's no middle ground. "This Is Rock", possibly the best Spanish rock magazine in its November number, Fran Garcia, musical reporter delights us with a 12-page dossier which tells of the transformation of the group's music from Blues, Benefit (1970), which is about to be published in a special edition to a Progressive Rock, A Passion Play (1973). The 12 pages, very well documented and written, are accompanied by some excellent photographs of the whole band or Ian Anderson 1971-1973 period, some of them a whole page. which is about to be published in a special edition to a Progressive Rock, A Passion Play (1973). of the whole band or Ian Anderson 1971-1973 period, some of them a whole page. This looks like a very cool magazine. I will try to find one very soon. A must have edition. I've now had a chance to read the latest crop of books about the band and, for what it's worth, all three can be added to Santa's list in my opinion for presents come 25th December or earlier if you can't wait. I for one do like books where the band members speak for themselves and all three in one way or another fulfil that premise. I've already commented on Brian Rabey's book and re-reading some chapters has not changed my opinion that it is a great read. Tim Smolko's book, while heavily into the "musical structure" of TAAB and APP, does allow non music readers a chance to delve deeper into the thought processes that Ian Anderson could have used to get the inspiration to compose both albums, especially APP. Whether intentionally or not, it does point the reader towards earlier forms of music and ideas which he may have been taught at school and certainly gives room for thought on the way each album was written. For what it's worth, I think Ian Anderson didn't write the music with the intention to deliberately copy prevous music forms but wrote what he thought was right for the ideas that he was formulating for both albums. Whether some earlier musical forms and idioms crept into his thought processes via osmosis is obviously open to question but the author does let the reader form his or her own opinions and, as such, has written much to think about. A worthy addition to the history of Jethro Tull. Dave Rees and Martin Webb's second collection of archive AND interviews is like revisiting an old friend and having originally read them in the magazine, they do in some cases reveal ideas from the interviewees that were at their early stages and, at other times, about to become a reality such as Martin Barre's solo albums and Ian Anderson's ochestral work. In a few cases parts of the interviews can seem to be a bit repetitive but then when they are read with the original context of the interview in mind it all seems to make sense and all credit to the authors for their perseverence in getting the band members to open up and speak freely about their hopes and aspirations. The interviews with Kit Morgan and Dee Palmer are most informative and in Dee's case very honest and thought provoking. I did like Andy Gidding's interview from 2003 which did raise a chuckle. Hi Andy. How is your long awaited solo album coming along ? Umm . . . not bad. I've nearly started it a couple of times. You haven't really have you? Well thanks Andy. Nice talking to you again. Any times chaps. Any time. Excellent Graham. That quote is as you say...wonderful!